Of all the different sub-genres of oral prose fiction developed by the Yoruba of Nigeria, the trickster tale is the most popular, especially among the nonruling stratum of society. Sekoni describes and explains literally what makes the trickster tale a trickster tale. The focus is to establish the phenomenology of the trickster tale discourse from a sociosemiotic perspective. 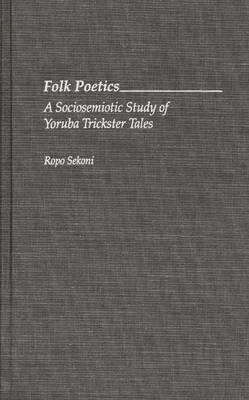 More specifically, Sekoni attempts to investigate the sociological and narratological conditions that govern the formation, transformation, and persistence of the trickster tale primarily among the Yoruba common people. At the same time Sekoni shows the uses made of the trickster among such contemporary writers as Soyinka, Achebe, Osofisan, and others. This study will be of particular interest to students and scholars of African folklore and literature, cultural semiotics, anthropology, and African-American literature.